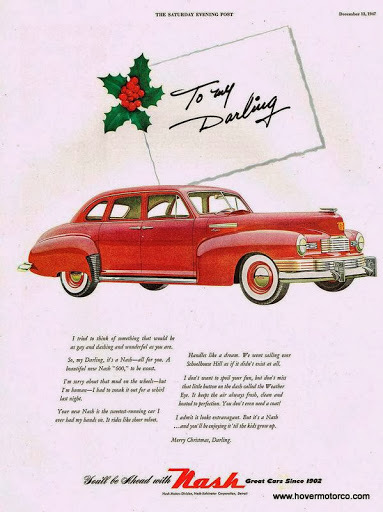 “To my darling—I tried to think of something that would be as gay and dashing and wonderful as you are.” They just don’t write ad copy like that anymore. 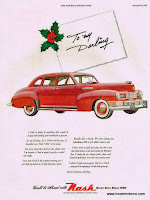 And I don’t know if I would use the words gay, dashing, or darling to describe a ’47 Nash. As ‘40s cars go, these were never my favorites. 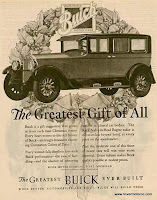 But this ad really stands out as a simple, vintage holiday production. “I’m sorry about the mud on the wheels—but I’m human—I had to sneak it out for a whirl last night.” I’m sure when she sees her new red Nash, this dude won’t have to apologize for anything. 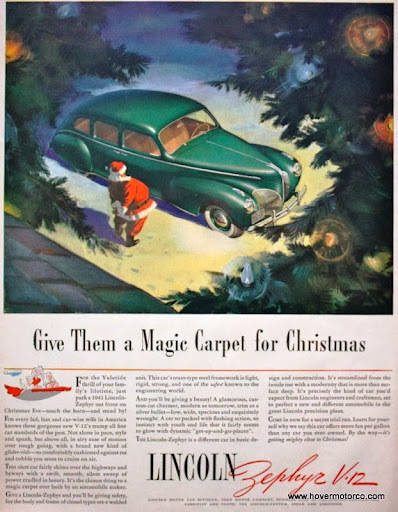 This ad right here tells us what Santa admires at Christmastime—a ’41 Lincoln Zephyr V12. Look at him there. He can’t take his eyes off of it. 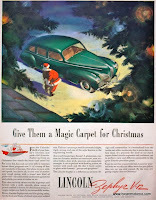 The copy states, “For the Yuletide thrill of your family’s lifetime, just park a 1941 Lincoln Zephyr out front on Christmas Eve—touch the horn—and stand by!” As I understand it, those old flathead V12s were a little finicky, but these were a very stylish, modern-looking car in their time. “Give them a Magic Carpet for Christmas.” Seems like a pretty good present to me. This ad is light on the copy but easy to understand. “The Christmas They’ll Never Forget.” It features a rich guy in a tuxedo, who looks a lot like Cary Grant, giving his jewel-encrusted wife, who is a doppelganger for Marilyn Monroe, the keys to a new ’56 Sedan Deville. 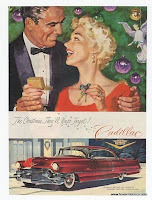 Cadillac ads rarely used much copy in those days. It was understood that they were fine cars without spelling all that out. Usually they featured high-fashion models and exotic jewelry to indicate how lovely they were. 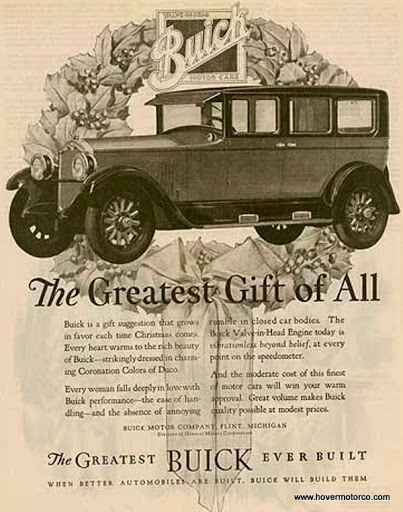 But in this case, they at least gave customers a call-to-action—buy one of these for your wife for Christmas. I think this one is really neat. 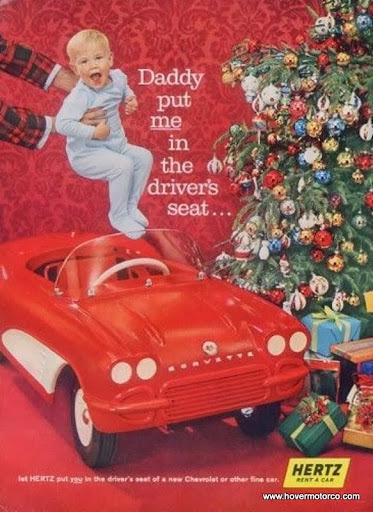 It’s a Hertz rental car ad that features a little kid getting placed in the seat of a 1961 Corvette pedal car. “Daddy put me in the driver’s seat,” it says. I don’t recall ever having seen one of these particular pedal cars for real, but I’d sure like to have it today. Heck, I might even like it better than that kid there, and he looks pretty happy. Interestingly, I noticed that they have a motorized 2014 Corvette Stingray available at the local department stores this year. So at least one thing hasn’t changed; you can still get your kid a cool, kid-sized new Corvette. 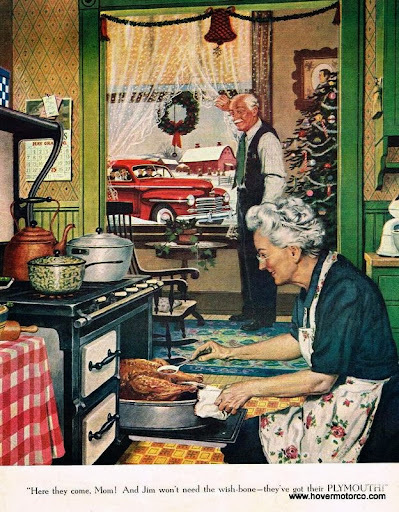 The slideshow below has quite a few old Christmas advertisements. Better version at this link. I hope you like looking at them. 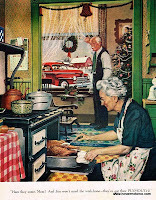 And even more importantly, I hope you and your families have a merry Christmas.